This FAQ was developed in response to the many inquiries we receive with regard to the educational opportunities we offer at the Dogwood School of Botanical Medicine. If you have a question, please take a look here first. If you can’t find a response to your question, please use our contact page to send us a message! To see the answers, please click on the plus sign (‘+’) next to the question. To close the question, click on the minus sign (‘-‘). I'd like to do some Ayurveda or herbalism courses, and see what I think. Any information you can provide on how to start would be great! One place to start is the American Herbalists Guild (AHG), which has established some guidelines for choosing a place to study. It’s worth noting that the Dogwood School of Botanical Medicine is a registered with both the American Herbalists Guild (AHG) and the National Ayurvedic Medical Association (NAMA). As for where to start with us, both Food As Medicine and Inside Ayurveda are great places to start learning, especially if you want to get going right away! If the online format works for you, and you’re a real newbie, I think herbmentor.com is a great place to start. But if you want to dig deeper, we’re like the next step. However, not every program is going to suit every person. Once again, a good place to start looking is on the American Herbalists Guild school listing. Can you give me a few more details about your distance learning courses? Is it for newbies to Ayurveda, or all levels? The Inside Ayurveda program is called an “introduction” because that’s what it is. It starts from a point that assumes the student has never studied or even heard of Ayurveda before, and so covers all the basic components. However, the sophisticated detail provided in the course means that the information contained in the notes will take you all the way from a beginner, to having an intermediate to advanced level of understanding of Ayurveda. For students that wish to continue studying, they can progress by following through with the entire mentorship program, or whatever facets that appeal to them. As for our other two courses, Food As Medicine and Phytomedica, the first of these was originally published as a book of the same name, written for patients and consumers that were interested in the therapeutic properties of food. The book, however, is filled with information, and although it approaches the reader at a beginner level, it also discusses many technical issues that are better introduced and discussed as part of a course. The Food As Medicine Online Learning Program is thus for anyone interested in the therapeutic properties of food, and is designed to provide students with a sophisticated knowledge of food that can be used for personal use and clinical practice. The third component of our distance-learning triumvirate is Phytomedica. This 28 class program is an integrated approach to the use of nutrition, herbal medicine, and preventative medicine in clinical practice, drawing upon several traditions and aspects of medicine, including Ayurveda, Chinese medicine, and clinical nutrition. Although it is optional, it is highly recommended that the other two distance-learning programs, i.e. Inside Ayurveda and Food As Medicine, are completed before Phytomedica is begun. When can I enroll for the distance learning programs (i.e. Inside Ayurveda, Food As Medicine, Phytomedica)? You can enroll for any distance learning program offered at the Dogwood School of Botanical Medicine at any time. If you wanted to time your enrollment with a new semester of Q&As and webinar presentations, there are two primary semesters, from Feb-May, and from Oct-Dec. Apart from this, our discussion group is available 24-7, 365 days a year. Likewise, once registered, you have complete access to all of the educational materials, including videos, audio, presentations, images and documents. How much time each week would you expect or recommend a student to spend studying? Apart from watching the recorded classes, participating in or listening to the Q&As, and completing the quizzes, exams, and assignments, we suggest the student spends about 2-3 hours per week reviewing the material, and participating in the discussion group. You have two years to complete our distance learning programs, and can ask for an additional one-year extension for an additional year for a $300 fee. To complete the entire mentorship program from start to finish, we give students a period of seven years. I don’t live in Canada or the US. Can I still participate in the distance learning courses you offer? Yes! We have students from all over the world, as far away as Brazil and Ukraine. The cost of the course includes shipping to most major destinations, all over the world, but if you live in a more remote area, there may be an additional charge for shipping the course materials. Does your Ayurveda program include in-depth study of pulse and tongue diagnosis? Pulse diagnosis (nadi pariksha) and tongue diagnosis (jivha pariksha) are two components of the ashtasthana pariksha, or the eight methods of diagnosis in Ayurveda. Both of these are covered in detail within the Inside Ayurveda program, but the actual application of these skills requires a great deal of study and practice. Many people also think that by learning these particular skills that they will be good practitioners, when the truth of the matter couldn’t be farther from the truth. Pulse and tongue diagnosis are important, but no more than any other type of assessment, and because they in large part are based in inference (anumana), if not grounded in a proper case history and examination, the assessment is much more likely to be in error. Nonetheless, they are both useful techniques, and during the Nepal-India Study Program, as well as during the Group Intensive program and clinical practicum, there will be ample opportunities to further the study of pulse and tongue diagnosis. I like hands-on learning. Will you be doing anything like this in the future or will you be sticking with distance courses? Please read more about our Mentorship Program below. As part of this training, the Dogwood School of Botanical Medicine offers Group Intensives about 4-5 times a year that are built along certain subjects or areas of clinical work. For example, one session may focus on digestive health, and the entire 2-3 weeks will be consumed with understanding every element of digestive function, including its anatomy, physiology, pathology, diagnosis, treatment, and case history analysis, weaving in a tapestry of techniques that can be incorporated into clinical practice. In addition to these regular events, the Dogwood School of Botanical Medicine is planning to provide additional mentorship opportunities in other areas of practice, including gardening, wildcrafting, and herbal pharmacy. The Dogwood School of Botanical Medicine is also working to establish a training institute in Nepal and India that would provide a mix of Ayurveda and basic paramedical skills to the local peoples, and would be looking for some students to stay on and help with this project. How is the Dogwood School of Botanical Medicine different from other schools and training programs? The concept and practice of education is as old as civilization itself, with clear evidence of schools and institutions of higher learning found in many cultures, including ancient India, China, Egypt and Greece. The similarity between all these cultures was a belief in the immutable ‘soul’ of the student, which required proper education in order to manifest its highest potential. This type of ‘classical’ education typically involved many facets in both the sciences and arts, to develop a well-rounded person that could uphold the principles of goodness (e.g. dharma), as well as fulfill their role in society. This type of education was typically informal, often performed outside or while traveling, carried out over a period of several years, ending only when the teacher felt the student had completed their studies. In contrast, the modern education system that most of us grew up with owes its origin and structure to a model developed in Germany during the 18th century, called the Prussian model of education. In many ways, this Prussian model unintentionally reinforces many aspects of 18th century Germanic culture that are at odds with today’s social values, such as income and gender equality. For example, there was a high degree of social stratification in 18th century Germany, with a hierarchy of wealthy landowners and aristocrats, and an underclass of soldiers and peasants that served them. The classroom environment within the Prussian model of education thus reflects this hierarchy, with students as the ‘serfs’ or ‘soldiers’, seated in organized rows, stripped of their autonomy, their attention focused towards the front of the room, submitting to the authority of the teacher, or ‘king’. The 18th century also the period during which the common people formerly self-employed in cottage industries, passing skills on to their children, were forced to work as employees inside dirty factories in terrible conditions, under constant duress and surveillance. In this way, the modern education system employs the same kind of factory model, with students herded into what are often fierce-looking or otherwise imposing institutional buildings, forced to huddle and move about from room to room, always under surveillance, always under the implicit threat of some kind of punitive measure if they don’t fall in line. The 18th century was also the beginning of the Age of Enlightenment, and with the printing press making it so much easier to transmit information, education quickly became reliant upon theoretical, or ‘book’ knowledge, whereas practical ‘everyday’ knowledge was scorned and consigned to the realm of second class citizens. A “well-read” and “literate” man was an “intelligent” man, regardless of whether or not he had any practical experience about which he read; or indeed, if his “educated” opinions on the subject were even true. In this way, the British were able to justify the suppression of Indian culture during the colonial period, by suggesting that the “educated” British had themselves given rise to Indian culture many thousands of years before. Likewise, in 18th century medicine, Western doctors were taught to eschew the benefits of herbal medicines, and instead employ high doses of mercury or drain patients of blood in the treatment of almost any disease, all based on the idea that these methods would somehow be helpful. In this latter example, the routine poisoning and bleeding of patients continued right up until the late 18th century, the evidence of which remains preserved in the title of a medical journal founded in 1823 called The Lancet, named after the sharp knife used open the patient’s veins for bleeding. This dissociative process, wherein humans create and maintain structures of logic that separate ourselves from the nature of reality, emanates from a broader cultural shift in European society that coincided with industrialization and modernization. In less than two centuries, Europe transformed from being a largely agricultural, faith-based society, to one that was increasingly industrialized, and mechanistic in its outlook. Thus, as the modern education system developed, the concept of the immutable soul of the student was supplanted by an industrial model, wherein the ultimate goal of education was to meet the needs of a rapacious machine, i.e. the ‘economy’, rather than instilling the values of goodness. Today, even the highest academic institutions continue to use this anachronistic model of education, all based on a factory model of herding large groups of students into room after room every couple hours, filling their heads with a diverse array of disjointed information, and then testing them periodically to see how well they can remember it. This type of education might work well if your life goal is middle management in a factory, but if you want to apply yourself skillfully in this world, and do something that truly matters, you will find this type of education is woefully inadequate. To apply any knowledge skillfully requires a great deal of time and practice, which is why working with experienced people is the fastest route to true knowledge. In this sense, “true” knowledge is practical knowledge, borne from decades and even generations of observing and bearing witness to the real time application of knowledge. It is the difference between studying how to drive a car in a classroom or a simulator, versus actually taking the car on to the road with an experienced driving instructor. True knowledge is the stuff that cannot be taught as a strict pedagogy. It’s been said before and it remains true today: nature does not write textbooks. True knowledge cannot be taught in an abstract, dissociated fashion. To learn how to do anything well, one must be taught personally how do it, or otherwise spend a great deal of time acquiring that knowledge on their own, through trial and error. Mentorship is a short-cut to a lifetime of experience. The goal of the Dogwood School of Botanical Medicine, and what makes it different from conventional academic training, is that it is designed to meet the needs of the student as best as possible. It’s not about “bums in seats” and “cramming for exams”. The Mentorship program is self-paced, multi-tiered, and modular in its approach, which allows for a great deal more convenience and flexibility for the student. The approach of immersing a student into one key subject area for weeks or months at a time is another key difference between the Dogwood School of Botanical Medicine and other training programs, allowing the student to fully comprehend and apply the knowledge, rather than jumping from subject to subject over a period of several years, only developing a cursory knowledge. The entire focus of the Dogwood School of Botanical Medicine program is to provide real time skills, based on the wisdom and skill of experienced practitioners, and venerated traditions. To be sure, science and academia inform our approach to knowledge, but free of corporate sponsorship, consumer products sales and government regulation, the Dogwood School of Botanical Medicine has chosen to chart a path towards the development of goodness in society, with the ultimate goal of creating good practitioners. How is the mentorship program structured? At the bottom of this diamond is the first level of training, which contains the distance learning courses, including Inside Ayurveda, Food As Medicine, and Phytomedica. Students that successfully complete these materials are then eligible to continue on to the second level. The second level is two-pronged, consisting of the Ayurveda in Nepal program and the Group Intensive Program. The prerequisite for the Nepal-India Study Program is Inside Ayurveda, whereas the prerequisites for the Group Intensive Program include all three components of Level One (i.e. Inside Ayurveda, Food As Medicine, and Phytomedica). The first Ayurveda in Nepal program will happen in early 2017, and will provide an authentic, practical grounding in Ayurveda. 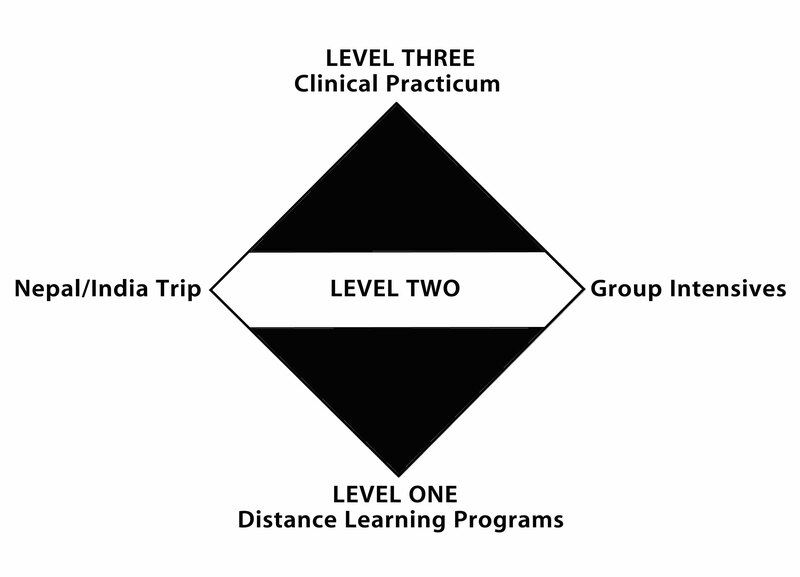 Following this, in the fall of 2017, we will begin to roll out the Group Intensive Program, consisting of 14 modules that address an important area of clinical work. Each one of these 14 modules will be held over a 2-3 week period, offered every 3-4 months. Thus, the Dogwood School of Botanical Medicine Mentorship program allows the student to continue living and working wherever they are, and only interrupt their busy lives for these periodic intensives. When Level Two of the Mentorship program is complete, students move on to Level Three of the Dogwood School of Botanical Medicine Mentorship Program, consisting of the clinical practicum. The Dogwood School of Botanical Medicine requires that students initially complete their first 50 hours of clinical training with the school, but after this, students are encouraged to complete their remaining 150 hours with other skilled clinicians that are recognized by the Dogwood School of Botanical Medicine. How many hours of training does the entire Mentorship Program comprise? All in all, we anticipate that the entire Mentorship Program would take about 4-7 years to complete for most students, but much of this depends on the student and how quickly they want to work. The advantage of this program is that it is self-paced and modular, meaning that the student can complete a significant amount of the course materials at their own pace, and participate in the Nepal-India Study Program and Group Intensive Program as their schedule and lifestyle permits. Please note that these are estimates, as the actual number of hours may vary from student to student, and programs and program hours are subject to change. Questions about credentials and certification. Could I become a certified Ayurveda practitioner or medical herbalist by taking your distance learning programs? It would be nice if one could study for only a few hundred hours or so, and become a competent practitioner, but the reality is that it takes a lot more time and knowledge to become proficient. The Inside Ayurveda is an advanced introduction to Ayurveda, and covers all of the basic concepts and practices. If one were to integrate and have a practical knowledge of everything that is taught in the Inside Ayurveda program, you would be a skilled practitioner. Unlike many other Ayurveda programs out there, ours is highly detailed and sophisticated, orientated to dedicated students that wish to pursue a path towards becoming a practitioner. As such, if you’re new to the path of Ayurveda, this course is not only an excellent and comprehensive introduction, but the information including the Course Notes will continue to be a resource for years to come. Likewise, the content in all our programs, transcend the separation between patient and practitioner. I was wondering what certifications are offered by the Dogwood School of Botanical Medicine, and if the school is accredited by any organization or association? Herbal medicine is an unregulated profession in both the United States and Canada, and currently, there are no legal protections or restrictions on the practice of herbal medicine. The actual laws that govern private practice are regulated by each state in the US, and by each province in Canada. Likewise, other countries have their own rules and restrictions. As long as you don’t call yourself a “doctor”, diagnose disease, and provide treatment with restricted substances (e.g. pharmaceuticals and drugs), there is little to stop you from practicing in most places. To bolster your professional reputation and to network with colleagues, we strongly suggest that graduates of the Mentorship Program apply for membership with national organizations including the American Herbalists Guild (AHG), the National Ayurvedic Medical Association (NAMA), or the Association of Ayurvedic Professionals of North America (APPNA). Depending on where you live, there may be regional associations as well, such as the Ontario Herbalists Guild in Ontario, or the Canadian Herbalist’s Association of BC. Along with a couple years of clinical experience, the training provided by the Dogwood School of Botanical Medicine is more than sufficient to successfully apply as a professional member to any of these associations. In addition to the Mentorship Program, the Dogwood School of Botanical Medicine is certified to offer continuing education units (CEUs) to members of the American Herbalists Guild, and we currently have applications to offer CEUs before the NCCAOM and the National College of Natural Medicine. What do I receive after completing one of your distance learning programs or courses? What do I receive upon completing the entire mentorship program? Upon the successful completion of the any of the distance learning programs, you will receive a signed, stamped and dated certificate of completion, indicating the course completed and the number of credit hours. Likewise, upon the successful completion of the Nepal-India Study Program, as well as the Group Intensive Program, students will similarly receive a certificate of completion for each module they complete. When each component of the entire Mentorship Program is complete, students will receive a signed diploma signifying the completion of their studies, and a professional endorsement from the Director of the school. What are the estimated costs for the entire mentorship program? At this time, we do not have final costs for every program. Currently, all of our distance learning programs are competitively priced, and we anticipate that because our focus is on the student, that we will be able to keep costs manageable. What are the estimated costs for the Ayurveda Overseas Study Program? The Ayurveda Overseas Study Program is separated into two components, including the Ayurveda in Nepal program, and the Ayurveda in Kerala program. The cost for each five week program is approximately US$3200, not including accommodation, food, insurance, and travel costs, with a 10% discount available to students that enroll in both. To learn more please visit https://dogwoodbotanical.com/courses/ayurveda-overseas-study-program/. Is it possible to obtain scholarships? Do you have a payment plan for low income and seniors, who can't afford to pay all at once? Currently, the Dogwood School of Botanical Medicine isn’t large enough to offer scholarships, but we do have options for a limited number of students that can’t afford to pay all at once. These concessions are made on an individual basis, upon written request. Do you offer any kind of payment plan for your programs? 3rd option, pay $100 when you enroll and pay the balance over a 12 month period. A 15% interest fee will be added to the payment plan.